The most useful and practical knowledge for building a variety of text data applications. 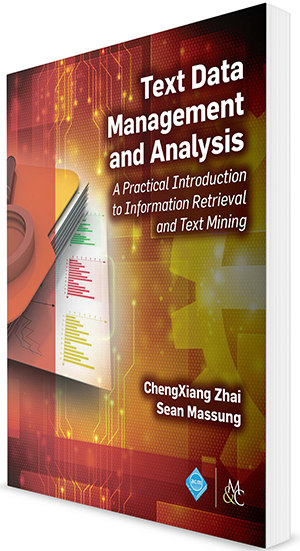 Text Data Management and Analysis covers the major concepts, techniques, and ideas in information retrievaland text data mining. It focuses on the practical viewpoint and includes many hands-on design exercises with a companion software toolkit (i.e. MeTA) to help you learn how to apply techniques of information retrieval and text mining to real-world text data. It also shows readers how to experiment with and improve some of the algorithms for interesting application tasks. The book can be used as a text for computer science undergraduates and graduates, library and information scientists, or as a reference for practitioners working on relevant problems in managing and analyzing text data. ACM Books is a new series of high quality books for the computer science community, published by ACM in collaboration with Morgan & Claypool Publishers. The series includes books from across the entire spectrum of computer science subject matter, appealing to computing practitioners, researchers, educators, and students. The series will initially focus on four kinds of books: graduate level textbooks; research monographs that provide an overview of established and emerging fields; practitioner level professional books; and books devoted to the history and social impact of computing. ACM Books are attractively published as ebooks and print volumes at affordable prices, and widely distributed in both print and digital formats through booksellers and to libraries (and library consortia) and individual ACM members via the ACM Digital Library platform. Previous story Where is the Science in “Data Science”?